Working on your car benefits you in many ways. For example, it boosts your safety because fixing underlying issues prevents mishaps in the future. Repairing it lowers your costs as well because repairs will cost a fortune if the problem worsens over time. Another benefit of working on a car is that doing so slows down its rate of depreciation. That means its resale value will be higher than similar models with the same mileage numbers. 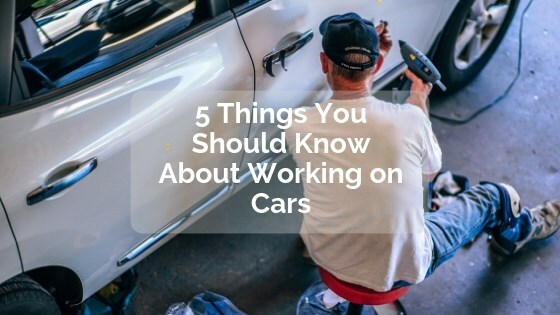 Here are 5 things you should know about working on cars. Knowing basic repair skills would help you solve most of the issues that you would face as a car owner. These repair skills include changing spark plugs, flat tires, and engine oil. Others are replacing air filters, wipers, and headlights in addition to jump starting the vehicle. Knowing how to change brake pads, switch batteries, and remove scratches on a car’s paint is also important. Working on automobiles without knowing these skills is impossible because they constitute most of the work that you would do on vehicles. Recognizing signs of trouble is a critical part of working on cars in addition to knowing what to do after identifying them. These signs include sluggish acceleration, squeaky brakes, and smoky exhausts. Others are difficulties starting the vehicle and excessive vibrations. Ignoring these signs of car trouble is unwise because the underlying problems worsen as time goes. Work on your car by fixing them as soon as possible. For example, replacing your shocks and struts might be necessary if your vehicle rattles when it goes over road bumps. The work that you do on your car is only as good as the tools and equipment that you use on it. That means low-quality tools and equipment would yield poor results. Therefore, choosing the right tools and equipment is critical to repairing and sprucing up your vehicle. For example, how do you pick the best torque wrench for cars? Well, examining several factors is essential. One of them is how much torque you want the wrench to produce. The preciseness of the wrench matters as well in addition to its affordability. Select a wrench that meets your needs. Prioritize your work on cars because you cannot work on everything at the same time. Start by focusing on specific areas where unresolved issues might give rise to catastrophic results. One of these areas is vehicle fluids. Have them at the top of your checklist, and then deal with each one of them in a systematic order. Start with the engine oil and then move on to the coolant and brake fluid. Examine power steering fluid and finally, check the windshield washer fluid. Sometimes, you might feel exhausted after working on many cars. Forgetting about some things because of this exhaustion is possible. For example, many people forget about windshield wiper blades as they work on their vehicles. Doing so causes terrible inconveniences in the future. Avoid this mistake by developing a checklist that contains commonly neglected items. Complete a task and then mark the corresponding box on this checklist. Then examine the parts of the car that you left unchecked after you complete everything else.